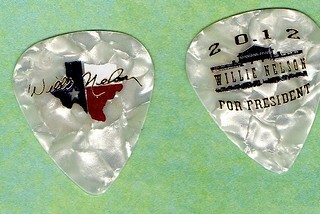 Another beautifully framed Willie Nelson Guitar Pick and photo, made by Guthrie Thomas Guitar Pick Company. Budrock “The Illuminator” Prewitt designed the pick, and Guthrie framed it so nice. Read more about the Guthrie Guitar Pick Company here. 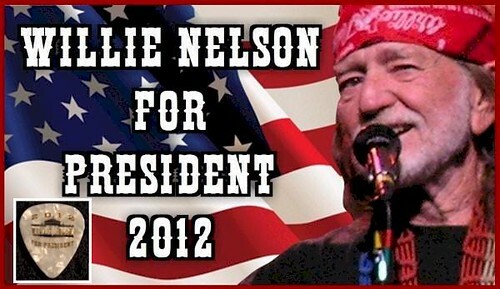 This entry was posted on Saturday, March 24th, 2012 at 2:40 pm and is filed under Budrock "Buddy" Prewitt, Guitar Picks. You can follow any responses to this entry through the RSS 2.0 feed. You can leave a response, or trackback from your own site. Where can I get one of these guitar pick’s? You can find them on e-bay from time to time. The band and crew get the new picks, and sometimes share them at shows. That is a nice guitar pick!